Every single moment, Earth is bombarded from all angles by charged particles from outer space called cosmic rays. 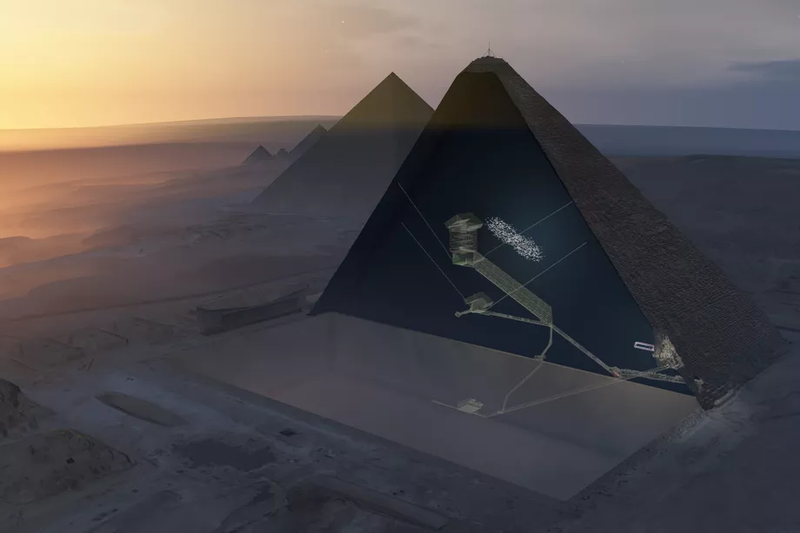 A shower of subatomic particles created by the interaction of cosmic rays with Earth’s atmosphere allowed scientists to peer through the Great Pyramid at Giza akin to how doctors would X-ray a person’s bones. The investigation led to the discovery of the first new internal structure inside the pyramid in over two centuries. The large void nested inside the 4,500-year-old monument is large but experts aren’t sure yet what to make of it. One day, such ‘pyramid x-rays’ might finally reveal how the megastructures were precisely built as well as their purpose. The Great Pyramids of Giza were built on a rocky plateau on the west bank of the Nile River some 4500 years ago. The northernmost and oldest pyramid of the group was built for Khufu (Greek: Cheops), the second king of the 4th dynasty. Khufu’s Pyramid, also known as Cheops, is the oldest and most impressive pyramid at the site. Some 2.3 million blocks of stone were used to erect this marvelous display of engineering and technical skill — a 5,750,000-ton megastructure. Once it was built, any man gazing it must have felt very humble. To this day — when we’ve managed to raise skyscrapers like the 829m tall Burj Khalifa — scientists are still debating how exactly the ancient Egyptians managed to build them. In 2016, scientists working with the ScanPyramids project began deploying Muon-detecting plates, three of them, inside Khufu’s Pyramid. 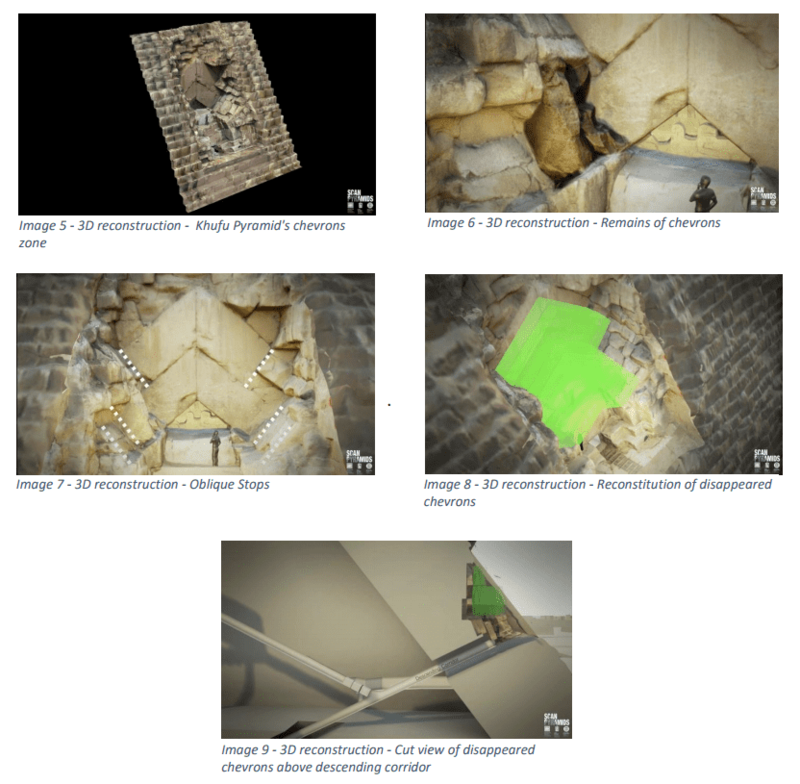 They then used a combination of techniques like infrared thermography, muon radiography, and 3-D reconstruction to peer inside the ancient Egyptian structures. Muons are made in the upper atmosphere when cosmic particles interact with atoms in the atmosphere. The muon is a fundamental particle that acts like a heavy electron, with a mass about 207 times that of an electron. Every second, hundreds of such particles pass right through your brain. But don’t worry, they’re totally harmless. What’s interesting about these particles is that they can be detected as they pass through structures, and just like X-rays can show the skeleton, so can a muon radiography reveal structures as the particles pass through voids or, conversely, get absorbed or deflected by matter. The newly discovered void is nearly 30 meters (100 feet) long, the ScanPyramids team reported in Nature. It’s right above and similar in size to the Grand Gallery, a passage that leads to the famous King’s Chamber. Previously, researchers used the same technology to probe the nearby Bent Pyramid, Dahshur, just outside Cairo, an ancient Mesoamerican pyramid in Mexico, but also Fukushima’s nuclear disaster zones. For each detector, a separate team was assigned to carry out the examination of the plates which become etched with lines of little black globules. All teams were able to detect the large chamber or void, lending confidence that the project is on the right track. The newly discovered void was a technical error, according to the new study, was less than 1 in 3.5 million. “These results constitute a breakthrough for the understanding of Khufu’s Pyramid and its internal structure. While there is currently no information about the role of this void, these findings show how modern particle physics can shed new light on the world’s archaeological heritage,” the researchers concluded. Based on archaeological finds, historical interpretations and what we know about the technology ancient Egyptians had at their disposal, there are a number of explanations as to how the pyramids were built. It is thought the Egyptians didn’t use the wheel at the time the Pyramids were built. It would have been of little use anyway considering the soft ground and heavy loads. Instead, the blocks were likely carried by sleds manually dragged by beasts of burden and men along transverse wooden beams which were likely lubricated. How these massive blocks were raised to the top of the pyramid is harder to determine. Extant ramps have been found at the pyramids of Amenemhat I and Senwosret I at Lisht and other sites. The ramps were made of brick, soil, and rubble dressed with brick for strength and served to raise the pyramid at least in the initial phases. Ancient ramps used to build the pyramids. © Copyright Dieter Arnold, Building in Egypt, pp. 87, 88. Whatever’s the case, there was nothing supernatural or mystic about how the Egyptians built their pyramids. Just because we don’t know yet for sure how they managed these feats of engineering, it doesn’t mean they were built by aliens. Give the ancient Egyptians some credit. They knew what they were doing.